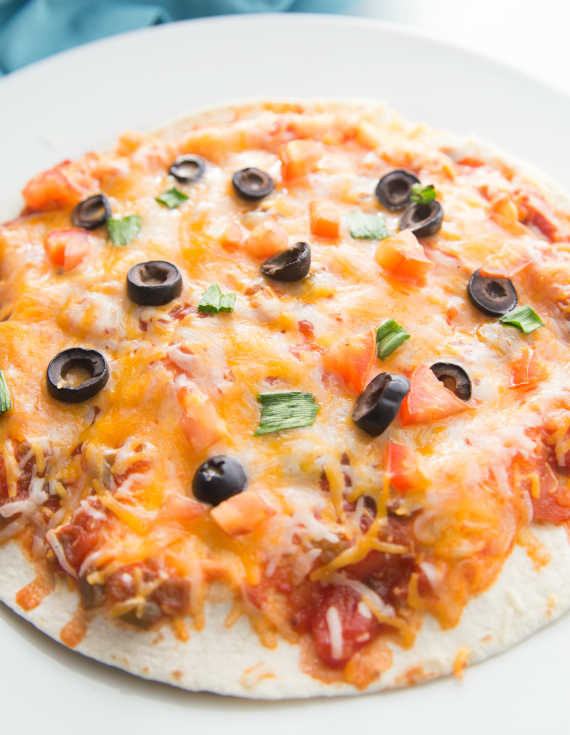 An easy-to-eat pizza with a Mexican twist. Holà, everyone! For some reason this warm weather has me in the mood for Mexican food. You probably could tell by all the recipes I have been posting lately. I came up with this on one of those I-don’t-know-what-I-want nights. You ever have one of those? You’re really in the mood for pizza, but at the same time, you’re really in the mood for Mexican. And I thought, hey, why not have both? 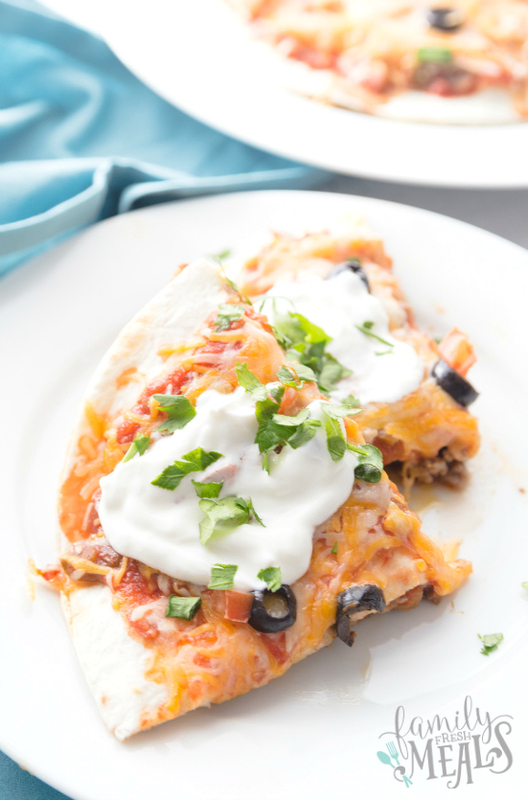 And then it got me thinking of the good old favorite… Taco Bell’s Mexican Pizza. 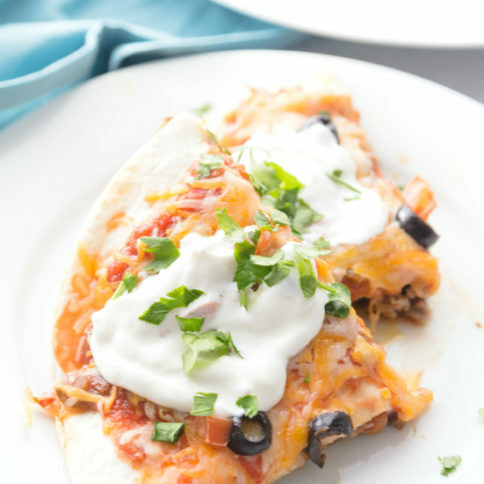 This Copycat Taco Bell Mexican Pizza takes all the flavors of Mexico and serves them up in a handy pizza form. It’s got flour tortillas for the crust, refried beans for the “sauce,” and ground beef, salsa, black olives, tomato, and green onions for the toppings. And cheese, of course. Lots of cheese, melted and golden and bubbly all over the top. 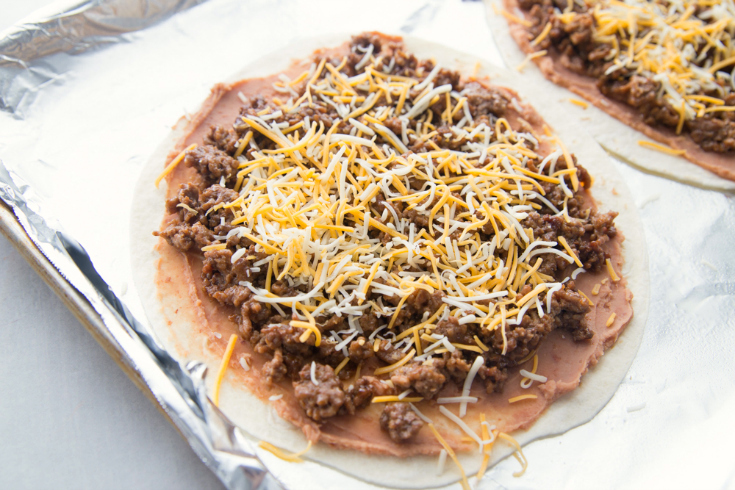 These have all the flavor of a good beef taco or burrito, but in a form you can slice and serve just like pizza. 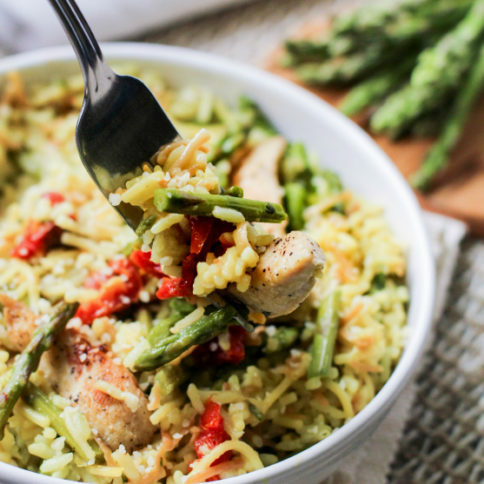 So they’re a great finger food for a party, or just a fun family dinner. 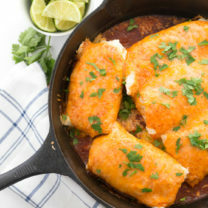 Top them with a little sour cream and cilantro to round out the Mexican flavor. NOTE: If you have extra time and don’t mind a couple extra calories, you can fry each tortilla for 30-45 seconds on each side in vegetable oil. Make sure to drain off on a paper towel. This will give you a more of the taco bell crunch! Preheat oven to 400 degrees F. Cook ground beef over a medium high heat. 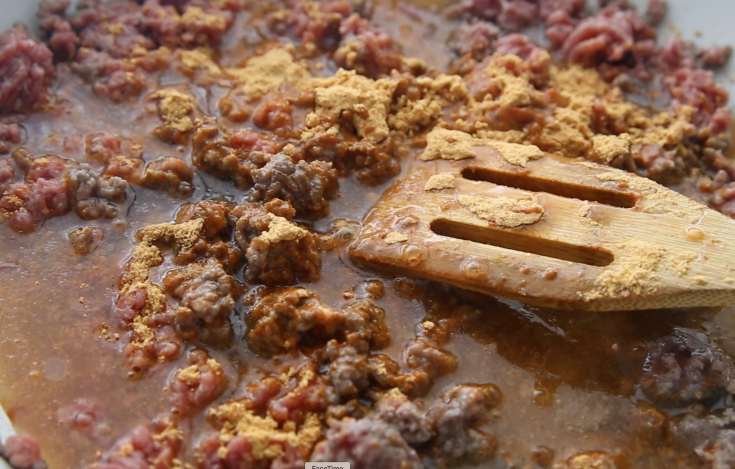 Once meats starts to brown, add in taco seasoning and water as indicated on the seasoning packet. Cook until meat is fully cooked through. Drain off any access fat. NOTE: If you have extra time and don’t mind a couple extra calories, you can fry each tortilla for 30-45 seconds on each side in vegetable oil. Make sure to drain off on a paper towel. 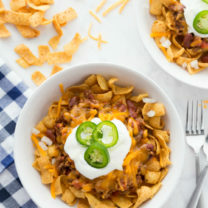 This will give you a more of the taco bell crunch! If not, these still taste yummy with non-fried tortillas. Line a baking sheet with aluminum foil, and spray with non stick cooking spray. Place 4 tortillas on baking sheet. 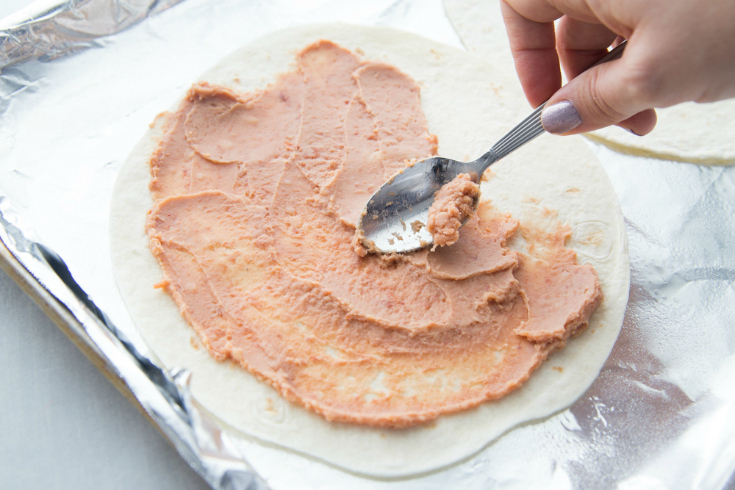 Spread 1/2 cup refried beans evenly over four tortillas. Evenly spread meat over beans and then top with 1/4 cup cheese. Top cheese with 2-3 Tablespoons salsa. Place another tortilla on top, and spread another 2-3 Tablespoons of salsa over the top. 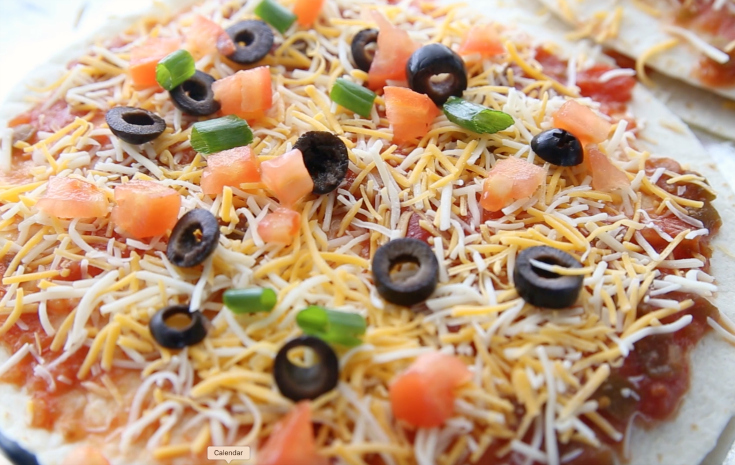 Sprinkle 1/4 cup cheese over the salsa and arrange olives, tomatoes, and green onions over the cheese. Sprinkle another 1/4 cup cheese over the top of each pizza. Bake in preheated oven for 10-12 minutes, until cheese is melted and bubbly. Top with a sour cream and cilantro. NOTE: If you have extra time and don't mind a couple extra calories, you can fry each tortilla for 30-45 seconds on each side in vegetable oil. Make sure to drain off on a paper towel. 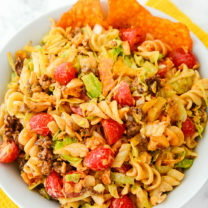 This will give you a more of the taco bell crunch! 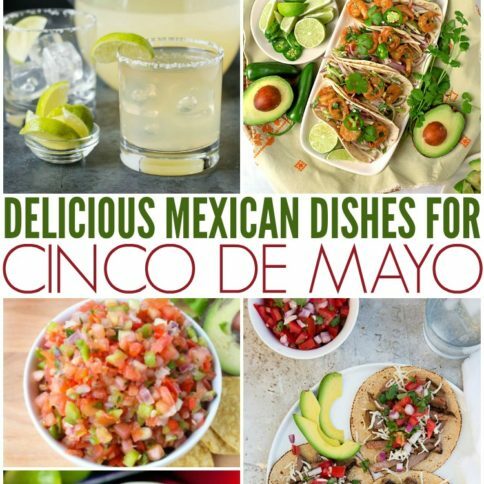 If not, these still taste yummy with non-fried tortillas.